Oakland CA – September 12, 2018 – The Air Sensor International Conference kicked off on September 12th through the 14th at the Oakland Convention Center, with many Federal, State, Tribal and International Agencies present to learn more about the emerging technologies being brought forth to help meet the measurement and monitoring needs for air quality standards. Particles Plus exhibited at the event displaying and demonstrating their newest air quality measurement instruments and OEM sensor technology. The EPA and other regulatory agencies have focused their attention on the sensors being sold commercially for professional use as well as general public sensors that have proliferated in online markets. 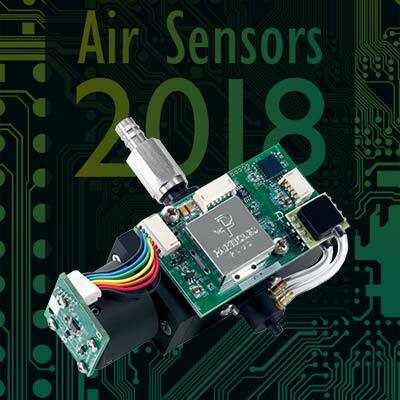 Their concern is how these products and their use will affect regulations and the overall quality of the sensors being provided to the ambient air quality monitoring markets. Particles Plus had their 9301-OEM Particle Sensor on hand to demonstrate the level of accuracy and cost effective application of their advanced technology products. The 9301-OEM Particle Sensor is a 0.1 CFM (2.83 LPM) particle sensor that uses advanced light scattering counting technology, measuring up to 6 channels of particles from 0.3 to 25.0 µm. The onboard 14-bit differential pressure transducer connected to a precision venturi helps insure and maintain an accurate and consistent flow rate. The sensor can be adapted to many different ambient air particulate measuring applications. Particles Plus has noted that their focus and dedication to the Ambient Air Quality Markets, Agencies, and Professionals has become a primary focus of their development and that they will be providing more patented, cutting edge products in the near future. For more information on Particles Plus particle counters and air monitoring instruments, their applications, technical questions, product specifications or pricing, contact Particles Plus today.